If a person looking for dental or orthodontic care is searching for a new practice in their area, they often turn to the internet for help. BIA/Kelsey reports that the majority of patients research online when searching for a local practice. Many medical professionals are turning online to market their practices; however, when a patient searches for a dentist or orthodontist in their area, you want to not only appear at the top of the search engines but you also want your practice’s strong reputation to appear at the top with you. Your practice was built off attention to your community and care for your patients – so show this online! Don’t try to force online clientele to realize your worth with a flashy website or robust claims – show it by demonstrating what you already have established with your current customer base. If you focus on the people you already treat, others will judge you by your actions and form an opinion and assumption about the way your practice will treat them. When companies reach out individually to their customers through social media channels, it shows the online world that they value their clients as more than just a Facebook friend or Twitter follower, but they truly care about that person as an individual. Reaching out personally to wish your patients a happy birthday or congratulations on getting their braces removed are ideas for ways to make your patients feel as special as they are. 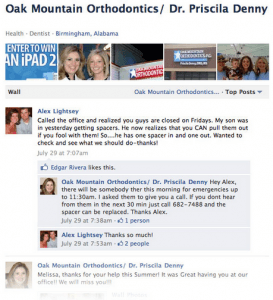 Online reviews are very valuable for building your practice’s reputation in the community. However, busy patients don’t always remember to leave reviews even if they are very satisfied. As a way to encourage them, combine incentives such as discounts or promotions with requests to leave feedback, and make sure it is easy for them to leave a review directly on your practice’s Yelp page or other review site by linking directly to the page in the request.You can also boost your client’s engagement by putting time-sensitive offers and discounts online only so they turn to your social media sites to receive special promotions they wouldn’t be able to otherwise. Encourage them to share the promotion to spread the word about what you are offering. Also, always remember to respond to client feedback and thank them individually if they leave positive reviews. It’s important to use social media to create the conversations your target audience is interested in, because your social media will not grow if you are talking, but no one is listening. For medical professionals, one of the most effective ways to use social media to provide relevant information about the practice’s hours, location, and treatment offerings, to answer client’s questions, and to relate to them personally. Giving your clients what they need is one of the best ways to get them to talk to you. Make it easy for your clients to look up any information they need about your practice online, and show that your social media channels can be an online forum for questions as well. Additionally, when sharing videos of community events your practice has participated in, tag relevant patients and thank them in the video. Establish your reliability by using the web as a way to provide constant care to their clients. Medical professionals can integrate their after-hours call center with social media so patients can receive quick answers 24/7. Make sure to answer all questions on social media and via email as fast as possible, as this will not only build your reputation with your current customers but will also show possible new patients that you emphasize responding to needs quickly.